There aren’t too many people that are happy about any spider encounters. Add into the equation the notion of poisonous venom and you certainly start to wonder which ones pose a threat. 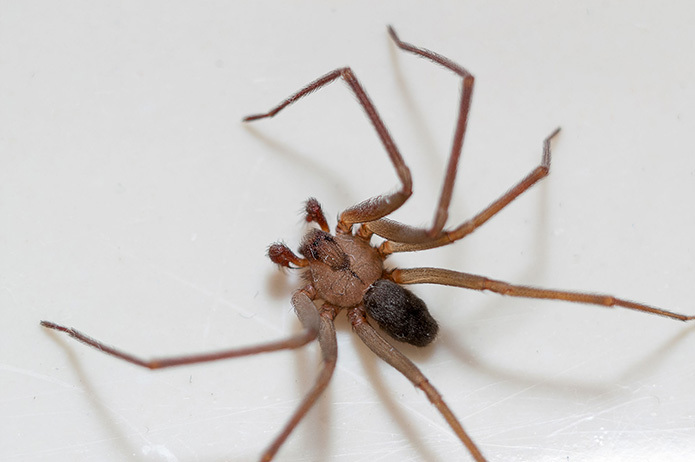 Is this recluse spider concerning for Michiganders? They are one of three North American spiders with significantly dangerous venom. They are native to the south eastern portions of the United States. However, as our climate changes, they have been seen in lower Michigan more frequently. They are very hardy, being able to survive mild winters. Due to this northern migration, they certainly can be a threat. They really don’t want to make trouble and tend to be very shy. In fact, they would rather run away than act in any aggressive manner when they are confronted. They hide in secluded areas during the day and hunt for food at night. Their webs aren’t their style to catch dinner. Instead, they lunge as they hunt, using their venom to immobilize their prey. Where would be the best place for these spiders to set up their home? Thinking about those hiding places, it could be beneath rocks, brush, really anywhere that provides some shelter. When it comes to hiding in homes, that could be basements, attics, sheds, a place to not be disturbed. They can hide beneath boxes, furniture, or clutter. They will spin their webs near any drafty access points into your home. This way they are ready whenever other pests try to enter. These spiders are great climbers and may find their place in gaps within the siding or rooftops. How do you know whether that spider crawling on your ceiling is one of these? You certainly wouldn’t get close enough to count their eyes, but if you could you would find six of them. The usual spider has eight. Their legs are long and thin with fine hairs on them. The main feature they possess as an adult is a distinctive dark marking on their back, close to their head that resembles the shape of a violin. They are about the size of a quarter and range from tan to dark brown. Their bites are rare, but just how serious are they? For 90% of people ever bitten by a brown recluse spider, they didn’t feel a thing and it healed quickly without any concerns. That other 10% involved severe symptoms. Their venom is necrotic. That means it can trigger cellular death when injected into living tissue. This affects the bite location and evolves into a large wound. Should there be any reaction, it would occur from three to eight days from the time of the bite. This area may blister, swell, and become painful. Other reactions can be vomiting, faintness, and cramping. Are other venomous spiders generally shy? Well, the notorious Black Widow certainly is! Similar to the brown recluse spider, it is very timid and their bites are also very rare. They also prefer the western lower peninsula of Michigan, especially the forests and rural areas. They are about the size of a paperclip, but their distinct feature is the red hourglass on their abdomens. They can also have red spots along the middle section of this region. Some may have an added feature of white stripes there too. Their venom is fifteen times more potent than rattlesnakes. One good thing is that they can’t administer as much as a rattler. It has a neurotoxin that is latrotoxin which affects the nervous system. The symptoms from their bite are very similar to that of the recluse spider and can be fatal. Now, their webs are used to trap dinner. They also love to spin this near any access points to homes. Both of these venomous spiders bite very rarely, are very shy, and love to set up their home near access areas to yours. You may never encounter one of these spiders. The hope is that you don’t. The best thing is prevention. Any drafty areas provide easy access for all types of pests into your home. For these spiders, it’s all about the available food source. Seal up these entrances and you prevent all types of unwanted “guests”! There are preventative measures you can take to keep spiders away. Keeping a clean house, making sure windows and doors are sealed, tightly covering food and spraying pesticides to name a few. However, if you find yourself with a severe spider or pest infestation, call Hi-Tech Pest Control today or schedule your free inspection. We use the latest equipment and 30 years of experience to eliminate your spider or any pest problem and instruct you how to keep your home spider-free as well as pest-free in the future.